Our purpose at the Bagnell Chiropractic Life Centre is to educate and adjust as many families as possible in order to achieve optimum health using natural chiropractic care. Unfortunately, the rising cost of healthcare can limit what people can actually afford. That is why we have created the Bagnell Chiropractic Wellness Club. Join today and experience the benefits. Members earn a discount on adjustments when purchased in packages which even include free adjustments. Ask us for details. What is the Chiropractic Club? 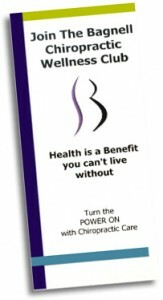 An exclusive membership club that provides you and your entire household with benefits from Bagnell Chiropractic Life Centre. First time members pay only $35.00 and renewing members only $30.00. This membership fee enables your entire household to benefit from the club. The entire year starting from the first day you join. Interested in joining? Call or stop in today and we’ll answer all your questions. *These discounts cannot be combined with other promotions, discounts or coupons.Some limitations apply. Contact us for all the details.